If you've been with us for the duration of the two hours of what should have been FP2, then you've essentially read the words of a man talking about rain and James Marsden (Google him). And for that, you should be congratulated. For more serious musings on the consequences of today's washed out practice session, read the thoughts of Andrew Benson right here. If there is a final practice tomorrow, we will bring it to you from 15:30 BST tomorrow, so please come back and join us. So, cancelling FP2 was definitely the right call. I'm looking at a live feed of the track in Austin. A terrifying darkness and shroud of rain has sunk over the Circuit of the Americas. All you can see is a flicker of an F1 logo in the distance, and nothing else. The sound is just a continuous howl of wind. I feel like I'm writing the first page of one of those terrible novels you see advertised at train stations. But the conditions really are horrible in Texas. I wonder if our boss at BBC Sport Towers has seen this? Can I go home yet gaffer? Did you know that Lewis Hamilton likes to tickle the ivories (or an elephant friendly ivory-substitute)? Well, if you'd read the world champion's latest BBC column, you would have known this already. It's just gone 3pm local time in Austin, and there will be plenty of soggy, disappointed F1 fans leaving a very soggy Circuit of the Americas. Nico Rosberg's Mastermind subject? Stating the bleeding obvious. Confirmation that there will be no more practice today. The reason is that the medical helicopter will not be allowed to take off for the next two hours, presumably because of the storm. I'm determined to turn this into a discussion of James Marsden's oeuvre. (See previous updates if you're confused). It seems Force India, Mercedes and Lotus are in the cool gang in the paddock. Why no invite for the other teams? With all this rain falling, it would be remiss of me not to use the opportunity to show you another picture of Daniel Ricciardo preparing food for punters. While we wait for action, take a look at how Lewis Hamilton can become world champion this weekend. Assuming he doesn't get swept out into the Gulf of Mexico. There are a few more people taking their seats in the grandstand, which could be false optimism. A race control car is testing out the track - but it's still lashing it down. Also, there's a guy out there holding a shovel, getting absolutely soaked. Maybe he's there to sort out some of the divots in the track? What if it rains forever? There's some awkward banter about phone numbers going on between Seb Vettel and the BBC's Lee McKenzie down in the Ferrari garage. Get a room already. On the rain, VetteI says: "If it's like this we can't run today. I hope tomorrow's better but the forecast doesn't look any good. It's a shame for the people in the grandstands." Listen to the BBC team talk about everything except the action on the track by clicking the Live Coverage button on this page. Oh, it really is awful in Austin. The rain is slapping down with the ferocity of a big fella dive-bombing into a swimming pool. That sounds like thunder rolling in the background. While the start of FP2 is delayed, feel free to discuss the merits of the acting work of James Marsden. Apparently he was in Saved by the Bell too! (I'm definitely not filling time). Green blobs bad. Red blobs more bad. Red Bull team principal Christian Horner talking to BBC Sport: "There's a lot more rain due. If we can run we will get out there because it could be like this on Sunday." Horner completely straight-bats questions about rumours linking them with an engine deal with Honda next year. "When there's something to tell, you'll be the first to know." He also told Sky Sports they'd be the first to know, so he's fibbing to someone. You can listen to commentary by clicking the Live Coverage button on this page. It actually looks like the rain has slowed some what - but the clouds on the horizon are big and nasty looking. So, while we wait for FP2 to start, why not take a look at the highlights (or should that be highlight?) from FP2. You can do so right here. Jenson Button is doing some schmoozing. Here he is with James Marsden. I wasn't sure who he was either - until I realised he's Cyclops from X-Men. One of the most underused characters of the franchise in my opinion. Most of us love it when it gets wet and wild - particularly during a race. 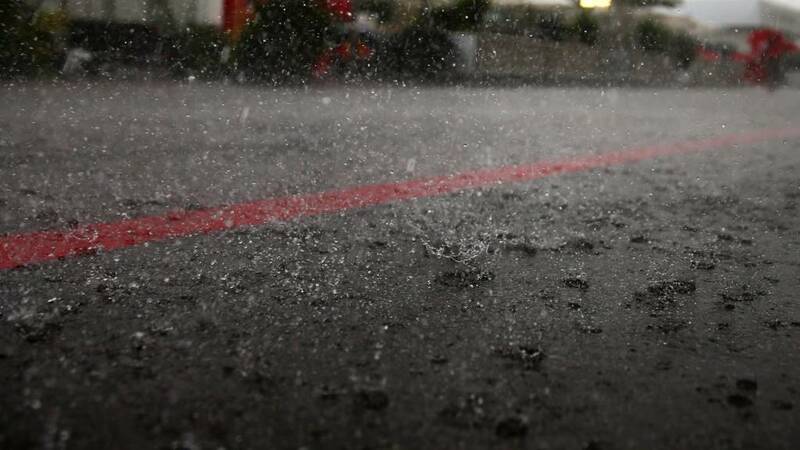 Tell us about your favourite rain-hit GPs using #bbcf1 on Twitter. There are currently yellow school buses going up the home straight every few minutes. It's a bit like a scene from a Hollywood disaster movie when they use all the school buses to evacuate a city. With this storm approaching, it might not be far from the truth. “The controversy over the collision between Kimi Raikkonen and Valtteri Bottas in Russia two weeks ago was still rumbling as the F1 circus pitched camp in Texas. "Raikkonen was not shifting from his opinion that he had done nothing especially wrong - ‘I would still do it tomorrow again’ - nor Bottas from his opinion that Raikkonen was over-ambitious. "Raikkonen, who had successfully pulled the same move earlier in the race, was asked whether he had not realised that Bottas would close the door if he tried it again. ‘I saw it in the end,’ he said, ‘but obviously once you’ve decided to go there…. I tried to brake and turn as much as I could but there’s no way to avoid it. Maybe he didn't expect it or didn't see me. I tried to slow down and turn in but y’know, in the end if there’s no space, there’s no space. We’re going to collide. Hamilton took to Snapchat in an attempt to amuse himself (and his many, many followers), saying he was "sooo bored". We'll give him that. It wasn't the most riveting of sessions. Here's a quick reminder of what happened in the first session. Nico Rosberg was top of the pile, followed by Daniil Kyvat, Sebastian Vettel, Carlos Sainz and Lewis Hamilton. Rosberg has to beat Hamilton on Sunday to stay in the title race. The German was on pole in this GP last year - but surrendered first place to his team-mate. Daniel Ricciardo is a talented gentleman. Not only is he currently getting ready for FP2, he's also on BBC One featuring in A Question of Sport. If you fancy giving it a watch, head over to BBC One right now. (But also stay here). Those thunderstorms are so close, Circuit of the Americas are warning people to take cover. I'm looking at pictures of the track - it's end-of-the-world rain. Ark-building conditions. So just like living in Manchester, really. Did we mention the rain? There wasn't much to get excited about in that first session. Will FP2 be any better? A lot will depend on the weather - there are storms lingering in the Austin area. In fact, in the last 20 minutes or so, the heavens have absolutely opened over the Circuit of the Americas. That's it for FP1 then. Why don't we all go dry off? Have a hot bath, maybe? I might. We'll be back here at 19:30 BST to bring you the second practice session - there's a concern the rain will make a return too. Until then, read Andrew Benson's report on the day's action so far. See you on the flip side (as they may say in the USA). Plenty of chat from you lovely people regarding your favourite wet-weather GPs. Keep it coming by using #bbcf1 on Twitter. So Nico Rosberg was quickest in FP1, setting a lap time of 1:53.989. There's just over a two-second gap to Daniil Kyvat and his Red Bull team-mate Daniel Ricciardo is in third. Carlos Sainz is fourth, Lewis Hamilton fifth. That's that then. Not the most exciting or revealing practice session ever. In fact, it might be the least exciting or revealing practice session ever. What we have learned is that the track is a bit bumpy. There's no change to the top five. Speaking of Fernando Alonso, he's decided to liven things up by going off the track. It's no catastrophe, as there's plenty of run off and he's back on his way. Three minutes of the session left and basically nobody can be bothered. Most of the drivers have gone back to their luxury cabins to enjoy a cup of herbal tea. Alonso and Bottas are out there. The Red Bull's of Daniil Kyvat and Daniel Ricciardo are second and third respectively. So to celebrate, here's a picture of Ricciardo serving food to a very happy customer. Jenson Button and Fernando Alonso are putting the McLaren to the test - but the results aren't scintillating at the moment. Alonso is 2.850secs behind Nico Rosberg, down in ninth. Button is almost another second further back in 13th. Nico Rosberg is out of the car and looking pretty chilled, leaning against a railing and taking in the times on a TV screen. We're unlikely to see the German out again in this session. Ferrari's Kimi Raikkonen and Sauber reserve driver Raffaele Marciello are the only men on the track right now, as we close in on the final 15 minutes of FP1. Raikkonen is more than two seconds behind leader Nico Rosberg after the first sector. “There’s nothing like a bit of pressure to focus the mind, and that is exactly what Fernando Alonso has put on McLaren and Honda with his comments on Thursday. "Is that realistic? ‘Yeah, I think so.’ The bold words were straightforward enough - we have good plans, Honda is optimistic about the progress they can make with the engine. The temperature has climbed slightly in Austin - which means the track is getting stickier. It also means we might see a bit more pace in the second session. Nico Rosberg leads Daniil Kyvat by 1.235secs at the top of the board. The top five remains the same, with Daniel Ricciardo, Carlos Sainz and Lewis Hamilton in there. So, 19 of the 20 drivers have registered a lap. The only man to not do so is Pastor Maldonado. The Venezuelan has been sat in the garage staring at his motionless car for most of qualifying - which some of the other drivers might be thankful for. Well done Valtteri, well done, sir. As is the way in the southern echelons of America, what was once a wet track has now dried up nicely. That will cause a few decisions around tyres though. Some started on wets, some on intermediates - neither might not be useful at the moment. And in further troubling Lotus news, Romain Grosjean is heard on the radio asking if the vibrating he feels when he brakes is "normal"? I'd say only if your brakes are made of strong cheese, Romain. “For some reason, Red Bull have been a bit coy about which spec of Renault engine they will run here this weekend. Renault have brought an upgrade, using 11 of their 12 remaining tokens, but the team claim it is worth about only 0.15secs a lap and therefore, as Daniel Ricciardo said on Thursday, ‘probably not worth’ the grid penalty, especially on the track on which they expect to be most competitive of the remaining four. Nico Rosberg has shed another second off his leading time, as he registers a 1:53.989. We're wet and wild in Austin, Texas this weekend. We want your memories of F1 in the rain - use #bbcf1 on Twitter to get involved. Valtteri Bottas almost takes out his whole Williams team with a slight misjudgment. The Finn overshoots the mark as he comes into the pits and causes a few engineers to wake up as they dive out the way. "Sorry for that," Bottas says on the radio as he sheepishly makes his way back on to the track. Lewis Hamilton is on the board and is fourth, 0.591secs behind team-mate Nico Rosberg. Between them are Daniil Kyvat and Daniel Ricciardo. It's a proud day for Alexander Rossi as he he takes to the track in his home GP. The Manor driver has the slowest lap of the nine drivers to register a time so far - but he's done it in this awesome-cool star-spangled car. “As expected, Fernando Alonso will have exclusive use of an upgraded Honda engine here in America this weekend - the one he used in Friday practice in Russia, where he took the grid penalty for it. But don’t get your hopes up - insiders say the improvement is marginal at best. "‘From the cockpit it is difficult to feel this kind of difference,’ Alonso said, ‘but the data shows the improvement on the engine is as expected. This is good news because there is a little bit of a different concept on how the engine is built'. Nico Rosberg has registered the quickest lap at 1:55.102 as a few times start to appear on the board. Five other drivers have completed a lap as the track looks to dry off a tad - Kimi Raikkonen, Jenson Button, Marcus Ericsson, Sebastian Vettel and Raffaele Marciello. Rain can mean many things. Drama, excitement or, if it's really bad, total boredom. Do you prefer grands prix when it's wet and wild? Or do you like a fair fight on a dry track? What are your most memorable races in the rain? What are the worst driving conditions you've ever had to deal with (feel free to send us a photo)? Get in touch on any of these using #bbcf1 on Twitter. Only Marcus Ericsson has registered a complete lap (2:01.702) - he mentioned that the home straight has a few unexpected bumps. Felipe Massa has complained of the odd river here and there on the track. Mercedes may be eyeing up a run out - and it will be with the intermediates. “The latest development in the increasingly ridiculous saga over Red Bull’s future engine supply is that the former champions have now approached Honda about next year. "It’s somewhat ironic that a team who claimed they would pull out of F1 if they did not get a competitive engine is now going cap in hand to troubled Honda. But leaving that aside for now, the reality is that McLaren have a contractual veto over any decision of Honda to supply a second team and it is highly unlikely they would want Red Bull to have one. Pastor Maldonado's Lotus has barely got on the track and it's having problems. He tells his team there is something wrong with the gear box and he'll be heading back to the pits to get it looked at, which is a shame, as I was looking forward to what the eccentric Venezuelan might get up to in the wet. Ericsson is joined on track by both of the Ferraris, who will be keen to give that new engine a run out. And now the numbers on the circuit are starting to swell. "It's not too bad," Ericsson says of the track on the team radio. Or more like, wet, wet wet. FP1 is under way and it's started with the thrilling drama of Sauber's Marcus Ericsson out on the track. An interesting side note: Sebastian Vettel suffered a penalty at the US GP last year for exceeding power unit changes. “Lewis Hamilton’s path to tying up a third world title this weekend with three races to go has been eased considerably by Ferrari’s decision to fit a new engine to Sebastian Vettel’s car. "Kimi Raikkonen, by the way, will also have a new engine. It is the Ferrari drivers’ fifth power-unit this season - one more than allowed - so that triggers an automatic 10-place grid penalty. Hamilton needs to beat Vettel by nine points to extend his margin sufficiently for the Ferrari man not to be able to catch him for the rest of the season. What that means mathematically is that if Hamilton wins the race and Vettel is lower than second, the title is Hamilton’s. To make things even better for Hamilton, Sebastian Vettel has been handed a 10-place grid penalty this weekend. The Ferrari driver is set to exceed the number of permitted engines this season. How can Hamilton do it? Lewis Hamilton could be a three-time world champion come Sunday. Hamilton needs to outscore Sebastian Vettel by nine points and his team-mate Nico Rosberg by two points. Simple really. “Lewis Hamilton could well clinch a third world title in Austin on Sunday, but let’s not get ahead of ourselves just yet. Before then, there is the small matter of a grand prix weekend to be get through, and if that does not sound that unusual a challenge, you have not seen the weather forecast. “It has rained overnight but the precipitation had stopped by the morning. But there has already been one heavy downpour this morning and if the thunderstorms due later on Friday are as heavy as predicted, there will be no chance of the drivers running on track in those sorts of conditions. "But even in more normal wet weather, it could mean an eventful weekend. ‘This track has so much elevation, so you’re going to get pools of water on it,’ Jenson Button said, before mentioning the problems experienced during a torrential downpour during last year’s World Endurance Championship race at the Circuit of the Americas. Hi folks. Welcome to the first day of practice at the US Grand Prix - a weekend where Lewis Hamilton can secure his third drivers' championship and seal his name among the immortals. Plenty of racing before that of course. So prepare to get all star-spangly as we hope to beat the rain in Austin, Texas.